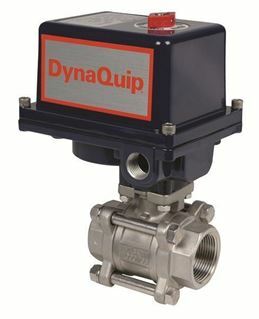 The E2S DynaMatic Series of electrically actuated stainless steel valves offers an excellent option for automated applications requiring corrosion resistant stainless steel. Two-piece design offers flexibility and rugged economy. These automated valves are available with 115VAC, 220 VAC, 24VAC, 24VDC, and 12VDC. All models are pre-sized for clean water, air, or light oil applications. Contact us for severe service or special actuator options. 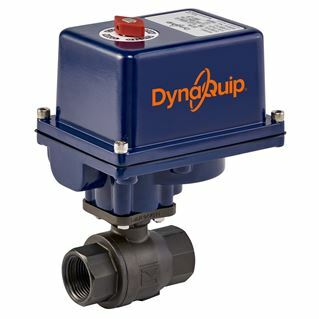 The E2C DynaMatic Series of electrically actuated carbon steel valves offers an economical and rugged option for oil and agricultural automated applications using hydraulic or petrochemical medias. Two-piece design is available in FNPT and offers flexibility and advanced maintenance options to increase the economic life of your equipment. These automated valves are available with 115 VAC, 220 VAC, 24 VAC, 24 VDC, and 12 VDC. All models are pre-sized for clean water, air, or light oil applications. Contact us for severe service or special actuator options. 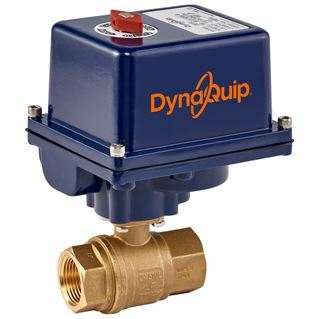 The DynaMatic EHH Series of electrically actuated brass valves offers an excellent option for automated applications requiring durable yet economical brass. These automated valves fit a wide range of applications, and all models are pre-sized for clean water, air, or light oil applications. Please contact customer service for recommendations and actuator sizing when dirty or severe service applications are needed. The EHH Series uses our DE and MA Series electrical actuators. The EHH Series valves are available with 115VAC, 220VAC, 24VAC, 24VDC, and 12VDC. The DynaMatic E3S Series of electrically actuated three-piece stainless steel ball valves offers an excellent option for automated applications where corrosion resistant stainless steel is required. The three-piece swing out style valve makes routine maintenance a snap. The E3S series uses our DE and MA Series electric actuators available in 115VAC, 220VAC, 24VAC, 24VDC, and 12VDC. All models are pre-sized for clean water, air, or light oil applications. Contact us for severe service or special actuator options. The E3C DynaMatic Series of electrically actuated carbon steel valves offers an economical and rugged option for oil and agricultural automated applications using hydraulic or petrochemical medias. Three-piece design is available in FNPT and offers flexibility and advanced maintenance options to increase the economic life of your equipment. The E3C Series uses our DE and MA Series electric actuators available in 115 VAC, 220 VAC, 24 VAC, 24 VDC, and 12 VDC. All models are pre-sized for clean water, air, or light oil applications. Contact us for severe service or special actuator options. The DynaMatic EVA Series of electrically actuated three-piece cast bronze valves offers an excellent option for automated applications where economical yet corrosion-resistant bronze is required. Three-piece design offers full port performance in a small package. Valve center section swings out for quick and easy maintenance and repair. The EVA Series uses our DE Series electric actuators available with 115VAC, 220 VAC, 24VAC, 24VDC, and 12VDC. All models are pre-sized for clean water, air, or light oil applications. Contact us for severe service or special actuator options. 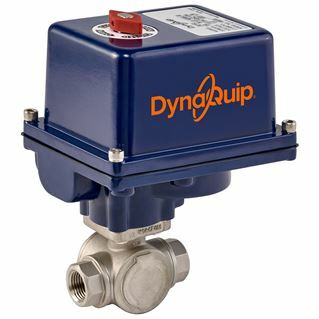 The DynaMatic EYSA Series of electrically actuated stainless steel three-way valves offers and excellent option for automated diverter-type applications where corrosion-resistant stainless steel is required. The EYSA Series uses our DE and MA Series electric actuators. 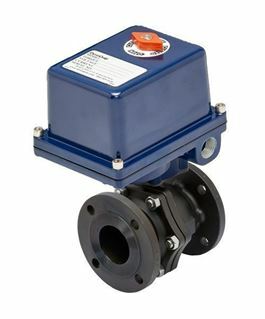 The EYSA Series valves are available with 115VAC, 220VAC, 24VAC, 24VDC, and 12VDC. All models are pre-sized for clean water, air, or light oil applications. Contact us for severe service or special actuator options. The DynaMatic EYSG Series of electrically actuated stainless steel three-way valves offers and excellent option for automated diverter-type applications where corrosion-resistant stainless steel is required. 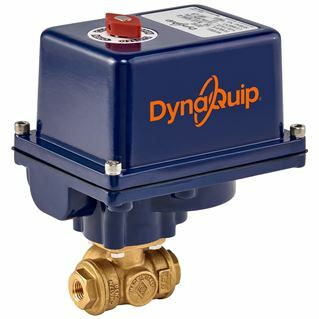 The EYSG Series uses our DE and MA Series electric actuators. The EYSG Series valves are available with 115VAC, 220VAC, 24VAC, 24VDC, and 12VDC. All models are pre-sized for clean water, air, or light oil applications. Contact us for severe service or special actuator options. DynaMatic EYH Series of electrically actuated three-way brass valves offers an excellent option for automated diverter-type applications. 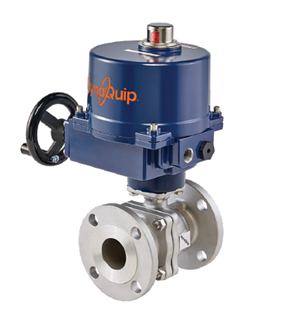 Designed specifically for actuation, the ball valves have O-ring seals for lower torque and longer cycle life. All models are pre-sized for clean water, air, or light oil applications. 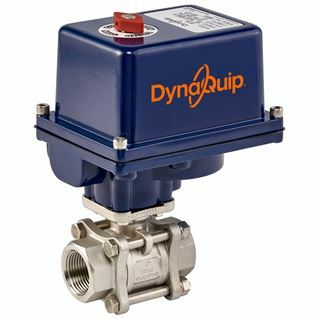 Please call DynaQuip Customer Service for recommendations and actuator sizing when dirty or severe service applications are needed. The EYH Series uses our DE and MA Series electric actuators, and are available with 115VAC, 220VAC, 24VAC, 24VDC, and 12VDC. 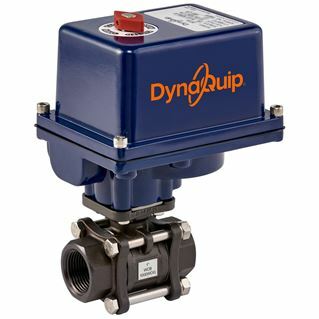 The E5S Flanged Series from DynaQuip offers excellent options when a flanged connection is needed. The ball valve is constructed of 316 stainless steel, and can be used for general chemical and corrosive fluid applications. The E5S Series is also full port and features 150 lb. ANSI flanges. The E5S Series uses our DE and MA Series electric actuators, and are available with 115VAC, 220VAC, 24VAC, 24VDC, and 12VDC. The E5C Carbon Steel Flanged Series offers an excellent option when a flanged connection is needed. The valve is constructed of durable carbon steel for industrial, hydraulic, or petroleum applications. The E5C Series is also full port and features 150 lb. ANSI flanges. The E5C Series uses our DE and MA Series electric actuators, and are available with 115VAC, 220VAC, 24VAC, 24VDC, and 12VDC. All models are pre-sized for clean water, air, or light oil applications.